The original version of this article, by Ethan Goffman, appeared on the Sustainability: Science, Practice, and Policy blog. In a time of polarized politics in the United States, over the environment and just about everything else, an overlooked development is how much the military, as well as the national security apparatus, has taken on climate change and other environmental challenges. “Environment and Security” was thus a profoundly important choice of theme for the 2012 National Conference on Science, Policy, and the Environment, held last week in Washington, DC. With the early effects of climate change apparently already occurring, notably in an increase in natural disasters and in a new northwest passage through the Arctic, those responsible for our security can’t afford to sit around and engage in speculation that climate change is caused by sunspots or isn’t really occurring. It is the military’s job, after all, to take action against potential threats rather than getting immersed in domestic politics. The concern with climate change is the next step in a widening of the concept of security from strict military matters, to include such interrelated strands as food and water access, public health, and the environment. Much of the military has already acknowledged that armed force alone won’t make us safe. “Energy security, economic security, environmental security, and national security are all inextricably linked. Address one and you need to think of the others,” explained Vice-Admiral Dennis McGinn at the conference. One obvious linkage is the connection of our oil dependency with security risks that can easily draw us into conflict in politically unstable parts of the world. Just how much the recent wars in the Middle East are about oil, and how much about a clash of civilizations, is a matter of considerable debate, although undoubtedly both factors play a part. The Iranian threat to close the Strait of Hormuz, choking outgoing oil deliveries, underscores vulnerability on the energy issue. From another angle, in Afghanistan, the military experienced the fragility of supply lines for a force strongly dependent on large quantities of oil. The Air Force, in particular, is working on algal jet fuel to free us from such reliance. And the Navy’s need for more icebreakers and other capacity shows concern regarding shipping and resource exploitation enabled by the melting of Arctic ice and the new passage. Continue reading on the SSPP blog. 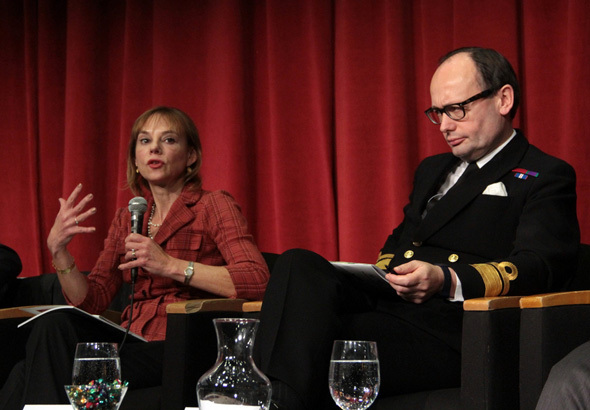 Photo Credit: Sherri Goodman and Rear Admiral Neil Morisetti, courtesy of Sean Peoples/Wilson Center. Topics: Afghanistan, climate change, energy, environment, environmental security, Iran, military, NCSE 2012, security, U.S.